She’s purged voter rolls, blocked Democratic candidates from running, and supported strict voter-ID laws. In early May, a federal judge extended the voter-registration deadline for the special election in Georgia’s Sixth Congressional District by two months, from March 20 to May 21. That allowed nearly 8,000 additional people to register to vote in time for the June 20 election. There was more than a little irony in Handel’s e-mail: Not only did she not want more people to register and vote, but shaping election rules to achieve a partisan outcome was exactly what Handel was known for as Georgia’s secretary of state from 2007 to 2010. She has a long record of making it harder to vote—supporting Georgia’s strict voter-ID law, trying to purge thousands of eligible voters from the rolls before the 2008 election, repeatedly challenging the residency of qualified Democratic candidates, and failing to secure the state’s electronic voting machines. Let’s start with the purge. Weeks before the 2008 election, thousands of registered voters in Georgia had their citizenship challenged by the state, a policy spearheaded by Handel. One of them was Jose Morales, a student at Kennesaw State University, a legal permanent resident since he was a toddler who became a US citizen in November 2007. After filling out a voter registration form in September 2008, Morales received a letter from Cherokee County telling him that he must provide evidence of his citizenship in court or would be kept off the voter rolls. Morales drove 30 minutes from his home in Kennesaw to the Cherokee County Elections office in Canton, to give the clerk a copy of his passport. He was told that was sufficient evidence to prove his citizenship and received a copy of his voting card a week later. But a month before the election, on October 7, 2008, he received another letter saying he was still not qualified to vote and had to appear again before the Cherokee County Elections office to prove his citizenship again or else he would be purged from the rolls. Handel criticized the lawsuit and spread unfounded claims about noncitizens voting. “Unfortunately, some groups appear to want to open the door to allow non-citizens to register and vote in the General Election,” she wrote. However, despite the court victory, nearly 5,000 registered voters were told by the state they had to cast a “challenge” ballot at the polls. Congressman John Lewis called it “an attempt to take us back to another dark period in our history when people were denied access to the ballot box simply because of their race or nationality.” Of the 4,700 “challenged” voters, 2,700 never cast a ballot or had their ballots rejected, according to the Atlanta Journal-Constitution. Handel removed Powell from the ballot and, even after an administrative court ruled in his favor, there were signs at polling places during the July primary that votes for him wouldn’t count and he was disqualified from running for office. Handel attempted to strike Powell’s name from the ballot on two more occasions through the courts before the Georgia Supreme Court ruled unanimously for Powell a week before the election. “No matter the outcome of Tuesday’s election, a loser has emerged—Secretary of State Karen Handel,” wrote the AJC. But the damage to Powell’s campaign was done. He lost to a Republican in 2008. “Opponents of photo ID have failed to produce even one voter who has been harmed by the requirement, despite nearly three years of scouring the state in search of such an individual,” Handel wrote in the AJC. My 73-year-old mother is one. After moving to Georgia from Florida, we attempted to obtain a Georgia ID. Based on the then-published requirements on the Department of Motor Vehicles Web site, we gathered proof of her new address (bank statement), birth certificate and valid Florida driver’s license. At the DMV, we where told that as of May, the secretary of state required her marriage certificate because the name on her birth certificate did not match her driver’s license. They would accept a passport with her married name, something she has never applied for. Tracking down and paying $40 for a copy of her marriage certificate. Two trips to the DMV, time and gas. Missing the July 15 primary. In fact, political scientists M. V. Hood III and Charles S. Bullock III found that the Georgia law did reduce voter turnout. When the law passed, they noted, 289,622 Georgia registrants—5.66 percent of the electorate—had neither a driver’s license nor state ID card. “Stated succinctly, we estimate turnout in Georgia in 2008 would have been about four-tenths of a percentage point higher had the courts blocked the law.” That doesn’t sound like a lot, but it could be enough to swing a close election. They called the turnout drop “a conservative estimate of voter suppression.” They also noted that Handel’s predecessor, Democrat Cathy Cox, who was secretary of state from 1997 to 2007, didn’t have a single case of in-person voter fraud reported to her office, which was the supposed justification for the law. 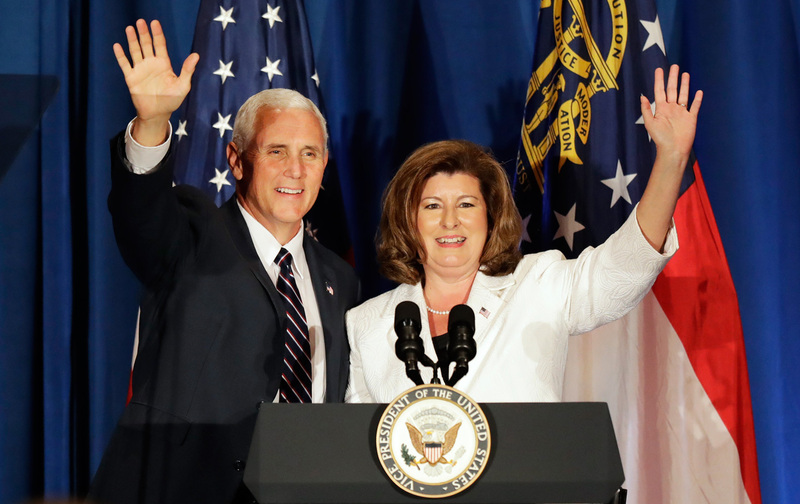 To this day, Handel cites the voter-ID law as one of her “most important accomplishments.” She said in a TV ad for the Sixth District race: “As secretary of state, I fought President Obama to implement photo ID and won,” even though Georgia’s voter-ID law was passed in 2005 and took effect in 2007, well before President Obama assumed office. In 2006, when Handel ran for secretary of state of Georgia, she made the security of the state’s voting systems one of her campaign issues. After her win, she ordered a security review of the systems and the procedures for using them. Experts at Georgia Tech conducted the review and found a number of security concerns, which they discussed in a report submitted to Handel. But, oddly, they were prohibited from examining the center’s network or reviewing its security procedures. Richard DeMillo, who was dean of computing at Georgia Tech at the time and led the review, told Politico he and his team argued with officials from the center in Handel’s office, but they were adamant that its procedures and networks would not be included in the review. But once they delivered the finished report to Handel, DeMillo says, “We never heard anything more about it.” It’s not clear whether Handel’s office acted on recommendations made in the report.